Giant corporations and opinion elites are calling for tax “reform.” When you hear the word “reform” coming from corporate lobbyists, just run. “Reform” as used by them never means anything good. The big, popular proposal in D.C. is “tax reform” to close loopholes that let big corporations and the rich escape some of all of their taxes, and (here is the catch) use the resulting revenue to lower tax rates for corporations and the rich. The “reformers” are not proposing to use that money to cut deficits and especially, especially not to provide jobs. They are not proposing to use the money to repair the country’s crumbling infrastructure, or for education or any of our other desperate needs. They want to use that money to give tax cuts to corporations and the rich. They call this “pro-growth” tax reform. When you hear the words “pro-growth” it always, always means lower taxes on the rich. This is the old “cutting taxes increases growth” mantra that says “government takes money out of the economy,” so the less money government (aka “We the People”) has, the more money is in the economy. (“Government doesn’t create jobs” and “government spending is bad,” etc… as if jobs in governments are not real jobs, and government spending is not done in the economy…) They say that if we cut taxes the resulting “growth” will increase tax revenue, etc. So in one breath we are lectured that the country’s budget deficit is so bad we have to cut Social Security, unemployment benefits and the rest of the safety net for regular people. And in the other breath they say the money we get from closing corporate tax loopholes should be used to lower corporate tax rates. Not to reduce deficits, not to rebuild the country’s infrastructure, not to educate our kids, not to strengthen our courts and law enforcement (especially law enforcement when it comes to the big banks) or for anything else we might do to make our lives better. No, that money should go to lowering taxes for the biggest corporations. “Tax reform” is really about raising more campaign cash and lining up more good jobs for legislators and staffers after they leave government. It opens up a process that lobbyists will go to town with. When the tax code is opened up for changes, lobbyists will swarm to make sure the changes benefit their clients. It also opens up career opportunities for legislators and their staffers. If they “play ball” and let the giant corporations have their way with them, later they can get high-paying (payoff) jobs with those corporations. If they make waves, rock the boat, etc., then no lucrative payoff jobs later. Fix the Debt, for example, is the CEOs of a bunch of corporations saying the deficit is terrible — and calling for big tax cuts for … their corporations. Policymakers should acknowledge that our growing debt is a serious threat to the economic well-being and security of the United States. It is urgent and essential that we put in place a plan to fix America’s debt. An effective plan must stabilize the debt as a share of the economy, and put it on a downward path. As if lowering corporate taxes will cut the deficit. Heh. And to make matters worse, they call for a “Territorial Tax” system, meaning they pay no taxes on profits they claim are made outside of the country — like how Google made $10 billion in Bermuda last year. Heh. The executives who run the giant multinationals want to be let off the hook for paying taxes on profits they make outside our borders. As an Apple executive said to The New York Times, giant multinationals “don’t have an obligation to solve America’s problems.” And to prove it, American corporations are holding $1.7 trillion in profits outside the country – just sitting there – rather than bringing that money home, paying the taxes due and then paying it out to shareholders or using it to “create jobs” with new factories, research facilities and equipment. The top corporate tax rate was 52.8% in 1970, 48% through that decade, then 46%, then the 1986 tax “reform” phased them down to 35%, which is where the top rate is currently. A 2011 report by Citizens for Tax Justice (CTJ) and the Institute on Taxation and Economic Policy ITEP) found that as a share of total tax revenue corporate taxes fell from 26.4 percent of total tax revenue in 1950 to just 7.4 percent of total tax revenue in 2010. Meanwhile personal income, Social Security and Medicare taxes increased from 51.4 percent to 83.8 percent of total tax revenue during the same time period. 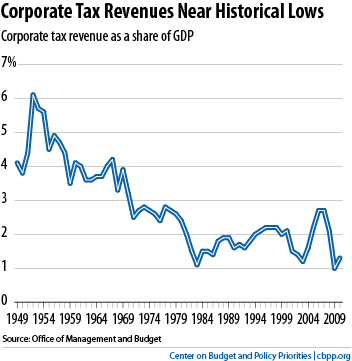 According to the Center for Budget and Policy Priorities (CBPP), Corporate tax revenues as a share of GDP have fallen to near historic lows. At 1.7% of GDP in 2009, the US has the third-lowest effective corporate burden in the world. according to the latest OECD analysis (for 2011 revenues), based on corporate taxes as percentage of GDP. What Do Smaller Businesses Think? What do the smaller businesses — the ones who cannot afford to purchase legislators and legislation that brings them competitive and financial advantages — think about these tax-cut proposals? Here is the thing. These deficit scolds and tax-cutting groups are always using the deficit to scare people and stampede politicians into doing things that benefit them and hurt We the People. 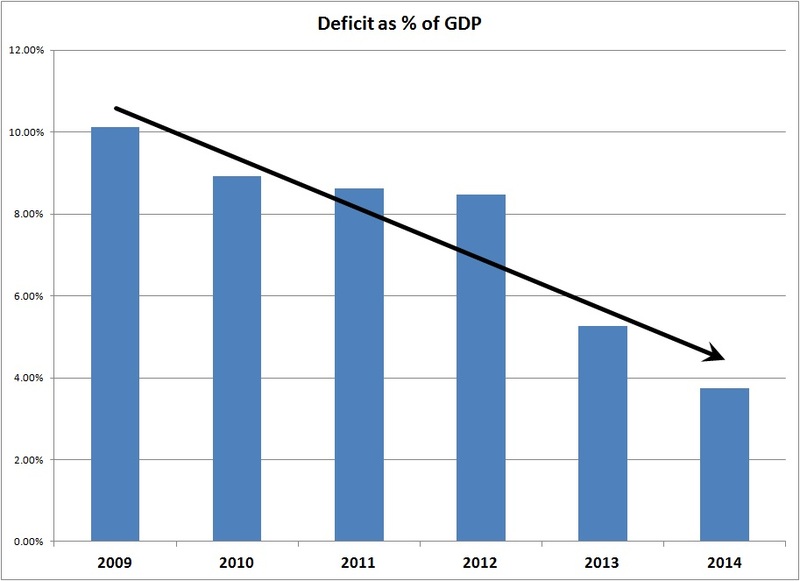 But the deficit is already down about 50% and falling rapidly. So at a time when the “Serious People” are calling for austerity to cut the deficit (that is already way down) they are also calling for big tax cuts — for them. Tax cuts were a mistake and caused these huge deficits. More tax cuts for corporations now are an obvious mistake. Europe’s experience and our own economic stagnation demonstrate that austerity is a mistake. With the deficit down dramatically, listening to deficit scolds is a mistake. And the idea that cutting taxes for the rich and corporations is a way to increase growth and revenue is not a mistake; it is just ridiculous. Government spending in a democracy is by definition things We the People do to make our lives better. It helps the economy and it helps us. We should do more of it. We should return tax rates on the rich and corporations to pre-Reagan levels to start to undo the damage done by the Reagan Revolution.